Toxic pollution affects the health of more than 100 million people, shortening their productive life spans by an astonishing 12.7 years on average. It is a common misperception that disease is responsible for most illness, when in fact toxins and pollutants in the environment are a major source of illness and reduced life spans globally. Unlike diseases, toxins and pollutants like lead, mercury, chromium, radionuclides and pesticides were created by humans and are often improperly disposed of in a classic example of fouling our own nests. “To be honest, we were astonished the number was so large,” said Bret Ericson of the Blacksmith Institute, a small international NGO that released its annual report “World’s Worst Pollution Problems Report 2011” last week. At least 100 million people are affected based on assessments of 2,000 toxic sites in 47 countries. Most of these sites are right inside villages and towns – all are close to people. “There are thousands more sites out there,” Ericson told IPS. In an effort to stem the rising tide, Blacksmith and its partner Green Cross Switzerland, a group focused on environmental health, work with countries such as Vietnam as advisors. A big part of the Vietnamese economy is based on what are called “craft villages” that are in reality informal industrial operations that even include village-level aluminium smelters, Ericson said. “These places have terrible emissions problems and it’s affecting the health of the people,” he said. “We’re working with the government to find ways to reduce emissions and recommend things people can do to protect their health. “We gave them a device to measure emissions of VOCs (volatile organic compounds) and they were delighted and eager to use it,” he said. Starting in 2008, Blacksmith and Green Cross Switzerland undertook an inventory of all the toxic sites they could find since most countries don’t have their own inventories or good data on what these sites contain. These are primarily legacy or abandoned sites and are all in the developing world. Ongoing industrial and large petro-chemical sites were not included. Blacksmith and Green Cross have also led many clean-up efforts, such as in Zamfara, Nigeria where more than 400 children had died of lead poisoning and thousands more have suffered brain damage. The Nigerian villagers were small-scale gold miners who crushed gold- bearing rocks inside village compounds. They did not know the ore also contained extremely high levels of lead. Children inhaled the lead dust which had spread throughout the community. 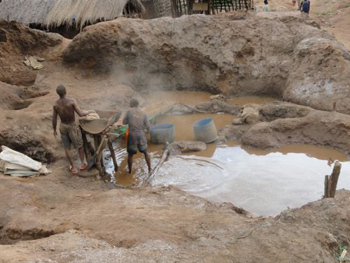 Other artisanal or small-scale methods for extracting gold involve the use of mercury. Mercury is both poisonous and a potent neurotoxin. “One-third of all mercury in the global environment is estimated to come from gold mining,” said Stephan Robinson of Green Cross Switzerland. “For every gramme of gold, two grammes of mercury gets into the environment,” Robinson told IPS. Like lead, mercury is an element, so it doesn’t break down. Once released into the environment, it is there forever. High gold prices, driven in part by growing demand for jewellery, tempts the poor in Africa, South America and Asia to use mercury as a cheap and effective method of extracting gold from mined soil and rocks. There are international negotiations underway on a global treaty to restrict production and use of mercury. It is expected to be passed in 2013. but enforcement will be difficult in the remote areas where much of this mining is done. “We estimate the health of 10 to 20 million people, including many children, is affected by mercury from artisanal gold mining,” said Robinson. Safer gold mining techniques like using gravity to separate heavier gold from the rest of the ore without mercury, or use of a container called a retort that can capture 99 percent of the mercury for reuse, need to be used more widely, he said. Increasing demands for metals of all kinds is resulting in more people working under poor conditions and producing ever more mining and processing wastes. Those wastes often contain toxins, making the mining and ore processing sector one of the biggest sources of health- damaging pollutants around the world, according to the report. Obtaining funding to clean up toxic sites or do education programmes remains a challenge because pollution is seen as an environmental problem. That’s why Blacksmith and Green Cross have spent several years doing health impact assessments. They are the first to measure the Disability Adjusted Life Years (DALYs) for toxic hotspots. DALYs are the common metric used by health officials to measure overall disease burden. It is expressed as the number of years lost due to ill-health, disability or early death. Based on their preliminary studies, the average DALY for these toxic sites was 12.7 years. That means people living near these sites have their productive life spans shortened by 12.7 years. This is on the same scale as malaria and other diseases, said Ericson. “It’s a major public health problem hiding in plain sight,” he said. Blacksmith will use the methodology to calculate the health impacts for all the polluted sites in its database so clean ups can be prioritised, he said. “We have found lots of nasty sites out there but we don’t have the money to clean them up,” Ericson said. This article was originally published by IPSnews.